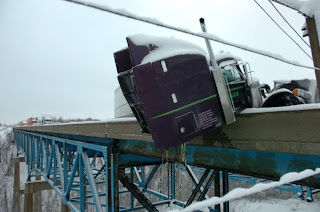 WAKADO: Fifty Car Pile-Up In Erie PA.
Truck driver Ron Hall was the man behind the wheel of this rig during the recent fifty car pile up on I 90 in Erie PA. 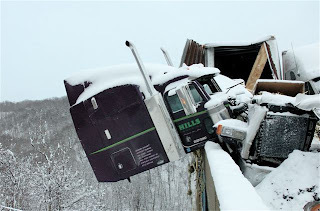 He opened his door when his truck came to a stop looked down to see that he was dangling 300 feet above the Wintergreen Gorge. Sure that he would soon die, he looked to his right and saw a man in a Carhartt sweatshirt walking the snow and ice covered 8" wide guide wall toward him, carrying a pipe wrench. The man climbed on to the wreckage, broke out the windshield and pulled Hall out of the cab,then walked him back along the ledge to safety When they made it to safety he turned, in tears, to thank the man, but he'd already walked away into the white out, presumably to help others. He never even got his name.